Stanley Kubrick’s psychological horror masterpiece is hypnotic, eerie and truly frightening. This visually astounding film, which made abundant use of the then revolutionary Steadicam, stars a top-of-his-game Jack Nicholson in his most famous role. The Shining is full of ambiguities which on repeat viewings are still not fully explainable. This dubiety only adds to the aura of this classic movie. The screenplay is based on Stephen King’s novel, but differs in many ways. By distilling the novel down to its basic narrative line, Kubrick left out much of King’s explanations, thus creating the film’s mysteries and adding to the sense of unease and dread. Great film. Read the book and think Kubrick made the right choice cutting some material from King’s novel. 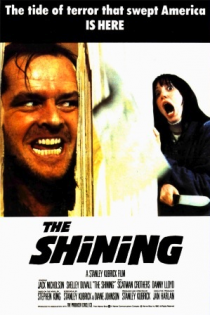 Shelley Duvall did a superb job in this film. I wish she had done more film work since then. The Shining’s ambiguity’s are part of the psychotic world he’s found himself in. Much of his psychosis is unexplainable. Yes! I love how you can watch it over and over and still not be able to explain everything! Great fun imitating Jack’s character as he starts to go off the rails. One of the all time great bad guys. The devil has all the best lines. This is great! I will be looking on here often to help populate my Netflix cue! I have never seen this movie, but I am about to read the book! I plan on watching the movie afterwards. Enjoy! It’s definitely one of Stephen King’s best. One of Jack’s best performances. I forgot it was a Steven King novel! Has any other author’s books been adapted for film more than him? Good question! Maybe a classic like Dickens? Stephen King certainly has had many of his books made into films – a lot of them badly, unfortunately.